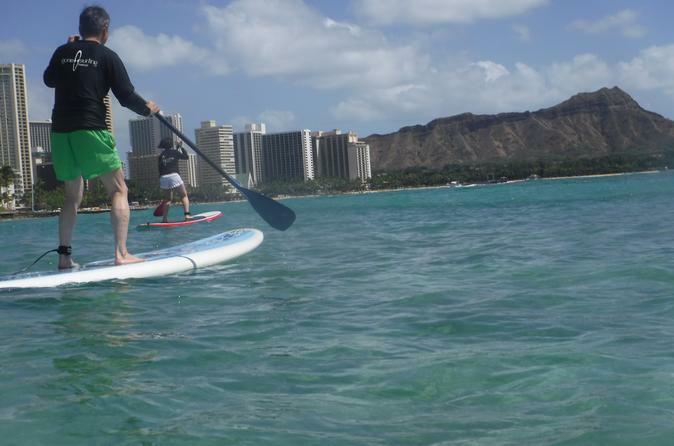 Experience a small group, stand-up paddle boarding lessons at Waikiki Beach by a licensed instructor. Get a lesson on ocean safety on the sand. Then your group will move into the water where your instructor will teach you the basics of riding the waves. Get an unforgettable stand-up paddleboarding lesson. Begin on the sand of Waikiki Beach with ocean awareness and safety. Then your licensed instructor will take you right into the water for a true ocean adventure. Once in the water, learn all the fundamentals of stand-up paddleboarding. If you’re an experienced rider, the instructors will help you perfect your wave riding skills. If you opt for taking friends on a big, group stand-up paddle boarding lesson, go for a minimum 2-person class size and up. This lesson does not group together people from different parties so each lesson remains private and intimate. Please note: Minimum age is 13 years. Each licensed instructor is trained in first aid and lifeguard CPR.